Angel wings fungus. Angel of death? 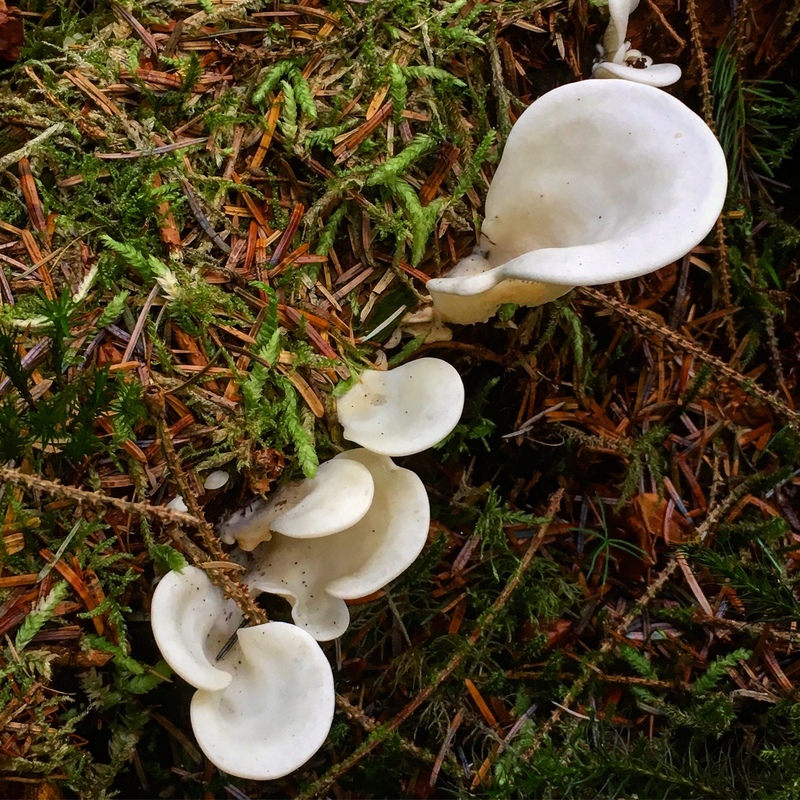 Here in Scotland the beautiful, fragile, delicate angel wings mushrooms are forming on the rotting stumps of old pine. They’re exquisite to look at especially around sunset when catching the last of the sun’s rays. They’ve been widely eaten as a delicacy, particularly in Japan where they’re known as sugihiratake (スギヒラタケ), for centuries. However their edibility has been brought into question by an amino acid that it can create, making it a bit of a ‘Russian roulette’ fungus. In 2004 during a particularly fruitful summer in Japan, it was unexpectedly linked to 55 cases of food poisoning with 17 deaths from encephalopathy. The deaths were in people of an average 70 years old with preexisting kidney conditions. In 2009 there was a single report of a death, also in a person with kidney problems on dialysis. Research has since found that if isolated and applied at high strength to the brains of lab rats, pleurocybellaziridine – the amino acid that it can form – is toxic to the myelin protection around the brain cells. Like phytochemicals the amount of a particular mycochemical in any one mushroom can vary significantly (10 fold is not uncommon) and it’s not known whether the summer of 2004 caused higher than usual amounts of the toxin. At the moment, no one is yet entirely sure why it affects elderly people with kidney disorders nor why the deaths occurred in 2004. Most of the people were already on kidney dialysis before the poisoning outbreak which was also unusual for a fungi poisoning in that the effects weren’t noticed until between 13 and 39 days. It appears that if the kidneys are compromised then they can’t break down the amino acid. It is then circulated in the body and crosses the blood-brain barrier to cause an encephalopathic condition not dissimilar to the symptoms of motor neurone disease. “A recent report in the Japanese newspaper Yomiuri Shimbun may provide clues that lift the veil on this mystery. Tomihisa Ota, a scientist specializing in natural products chemistry at the School of Natural Sciences and Technology of Kanazawa University, has found that when mice are injected with an extract of the sugihiratake mushroom, they suffer a toxic reaction that causes kidney failure. Not exactly the effect you want your wild mushrooms to have on your body! The research team, led by Professor Ota, obtained the extract by heating sugihiratake gathered last autumn in Tohoku and Hokuriku Prefectures (Japan) to 90° C for 30 minutes. The team injected mice with one milligram of extract per gram of body weight. Seven of the ten mice injected died within 24 hours. The mice are suspected to have died of shock caused by damage to red blood cells and kidney failure. The toxic effects were not seen in extracts heated to boiling (100° C). Quoted from The Mycophile, magazine of the North American Mycological Association, vol 46(3), 2005. While the quoted study doesn’t look specifically at the effect of heat on pleurocybellaziridine, it may well be that the cooking method breaks down the amino acid. Until more research is available, we just don’t know and caution is advised! Was the content of toxicants in the mushroom extraordinary high in 2004 due to the extraordinary hot and humid weather conditions this year? Was the consumption exceptionally high in 2004, as the Angel’s Wings could be collected in large quantities this year? Is pleurocybellaziridine the causative agent (the anticipation is mainly based on cell culture studies and data from very limited studies in mice)? Do all collections of Angel’s Wings contain the agent (pleurocybellaziridine) that caused the outbreak of intoxications in 2004 or are there various forms of the mushroom? What is the mechanism of the acute encephalopathy after consumption of Angel’s Wings?